Degrees are the academic awards that you give to students who complete a course of study at your school. They include everything from your standard 2-year, 4-year, and graduate degrees to post-secondary awards and certificates. Degrees can include specializations—majors, emphases, etc. Degrees are created and managed in Academics > Degrees. Name and abbreviation: Bachelor of Arts, B.A., and so on. 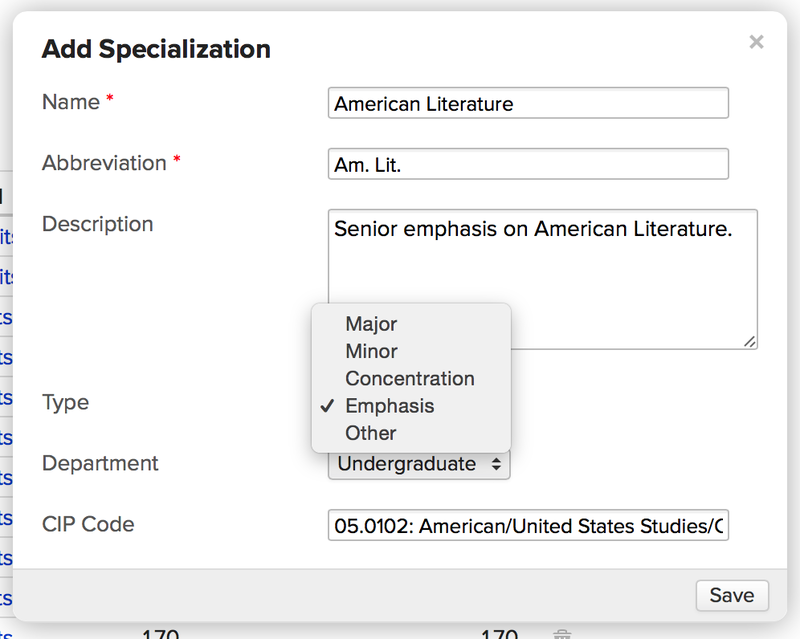 Don't include majors and minors—those are considered specializations. Description: What's the degree for? What are the basic requirements? Just sketch it out (this field is optional). Program: What Program does this Degree fall under? Department: The Department responsible for the Degree. Length: How long does it typically take for a student to earn this degree? This field helps supply data to various reports (Clearinghouse, Academic Progress, and more). Level: Whether the Degree is an Associate's, Bachelor's, Master's, and so on. Your options here are determined by the level of the program chosen in step 4 and conform to those defined by the U.S. Department of Education's IPEDS program. Distance Education: Check if students have the option to complete this degree entirely via distance education. Diploma: Check if this degree nets the student a diploma. Set up specializations (see below). Add general and course requirements. After you create the degree and finish adding requirements and specializations, you'll be able to change its status. All degrees start out under Construction. Construction: The degree is still being defined and is not yet available to students. Active: The degree is currently being offered to students. Retired: The degree is no longer offered to new students. Current students may still be pursuing it, but once they're done, it is simply kept around for historical records. Each degree can have multiple specializations. Specializations can only be associated with one degree. 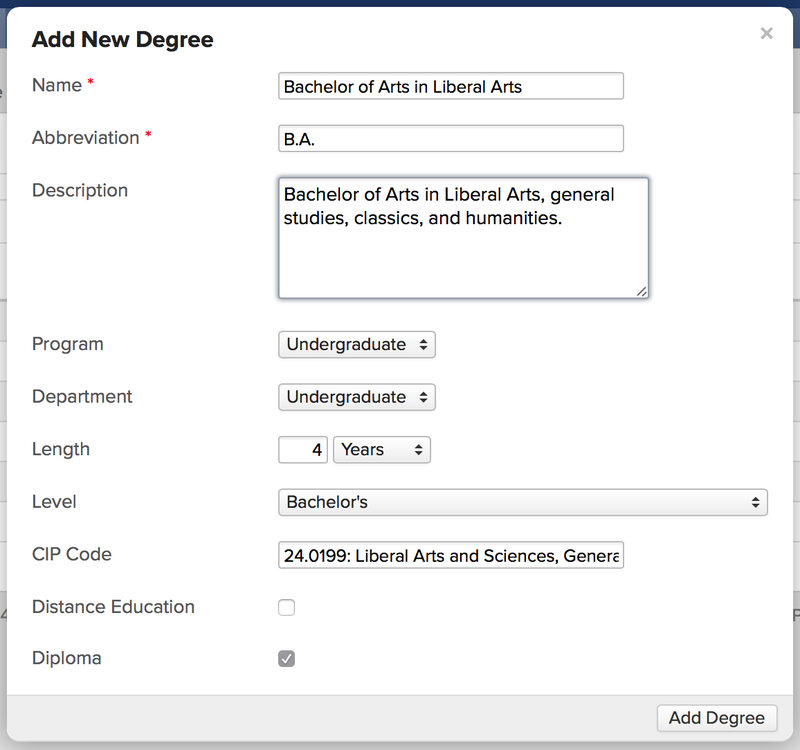 On the degree's page, click add next to Specializations. Give it a name, abbreviation, and description. Select the type—major, minor, emphasis, etc. Select the department and choose an optional CIP code. Remember, deleting is only for mistakes! For example, you already have a Bachelor of Arts set up, but someone went and added a duplicate B.A. 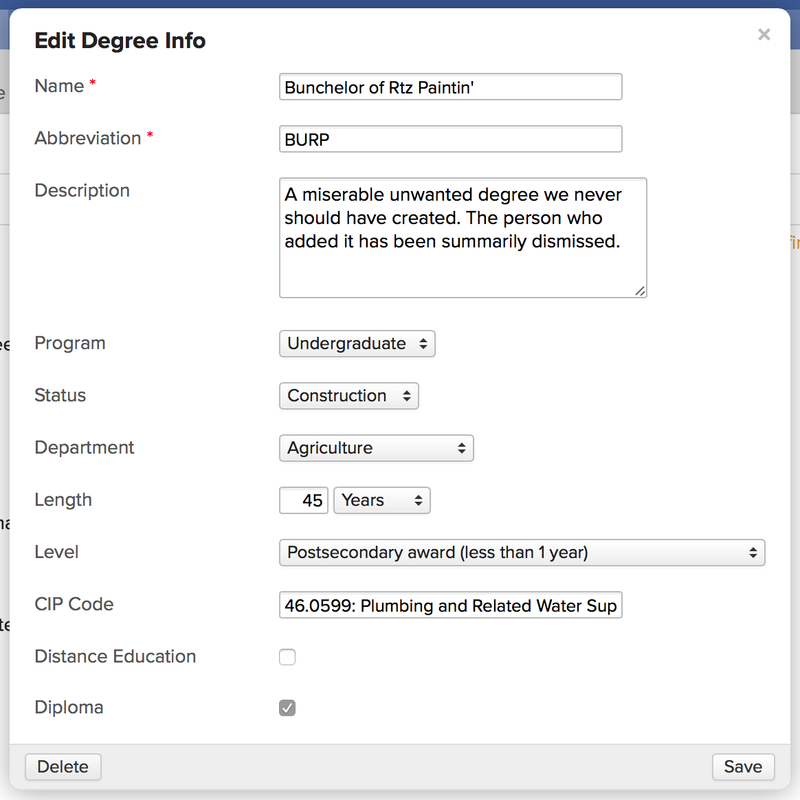 At any rate, you can't delete any degrees or specializations that are connected to a student record. On the degree or specialization page, click edit next to Information. If you can delete the entity, you'll see a delete button in the corner of the dialog. Click it and confirm your decision.